Welcome to Bhurban Hill Apartments! Why stay in hotel rooms when you can enjoy more space, comfort and luxury in our fully furnished apartments situated in the heart of Bhurban, Murree? At Bhurban Hill Apartments you can select from an exclusive collection of five individually designed, one and two bedroom non-smoking luxury holiday apartments with separate lounge and kitchen. These are the apartments corporate clients and families dream of staying in Pakistan. In our aparthotel you will enjoy the intimacy of your own private residence. Each apartment features its own balcony, fully equipped kitchen, private garden, elegant furnishing, spacious lounge, separate kitchen and large windows with stunning views. The apartments include all modern facilities featuring Wi-Fi, hair dryer, iPod dock, DVD player, LED TVs, marble floors, wooden floors in bedrooms and on-site parking. Stay in our dazzling Penthouse with magnificent views for unprecedented experience. One of the special features of Bhurban Hill Apartments is its own natural water for all its guests. Bhurban Hill Apartments offer easy access to Murree if you want to enjoy snowfall or thinking to explore the natural beauty of Murree and its surrounding areas. It is an escape from Pakistan's hot temperatures during summer and school holidays. 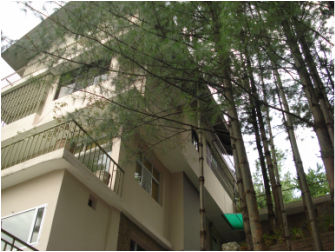 Bhurban Hill Apartments are surrounded by pine trees in a quiet environment in Bhurban, away from noise and congestion. Our apartments are the best choice if you plan to stay away from the crowd of Murree but have easy access to the main sites of Murree including Mall Road, Kashmir Point, Gilliat, Nathia Gali, Ayubia, Patriata, Kohala bridge, Golf Course and PC Bhurban. By staying with us you will experience a luxurious, unique and comfortable stay in Murree, be it for leisure or business purposes. It is an enclosed compound with secured parking, boundary wall, fence and guard ensuring the safety of our guests. You will also appreciate our family-friendly approach, space and privacy we offer when travelling with children.